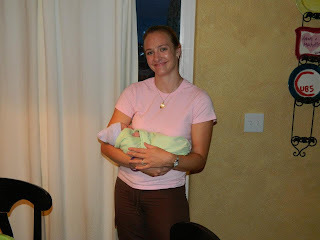 Into Loving Arms HypnoBirthing: Welcome Baby Brynn! I've had a few full circle moments in the scope of my career teaching and supporting families in birth, but I have to say that this family is particularly special. Not only is Mom my best friend, she is the reason I started birth work. You see, when I gave birth to my first daughter, she was right behind me giving birth just 6 weeks later. I went to her house the morning of that birth, 6 week old newborn in tow, to support her during her labor. This was my "aha" moment that led me to my work. Now, a little over 4 years later I have been teaching HypnoBirthing and supporting many other families in their birth journeys and I could not be happier. So yesterday, when I was blessed to be present at her third birth, at home, in the water, I couldn't help but wipe away a tear or two of happiness over what this truly means to me. Mom also ROCKED this birth, and beautiful Brynn was born a little under an hour after I arrived, after just a few hours of regular labor and a few minutes of breathing her down. I've known this amazing lady for 10+ years, and yet watching my friend birth still amazes me. She is STRONGER than she lets on, and as devoted to her children as anyone I've ever known and this shows when she births. She does this for her babies, and yet has grown herself with each of her births. I was so impressed at her focus and awareness with this birth, allowing it to happen in it's own way. When posting the picture below Mom said "about 16 hours old! A very content little girly so far! 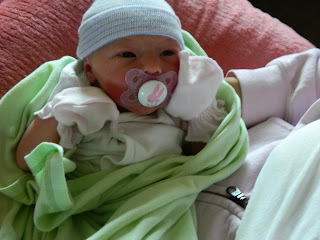 Must be a HypnoBirthing baby :)" Congratulations to an amazing family, and a very Happy Birth Day Brynn!